I wanted to create a scene with fireworks over a skyline and I thought it’d be fun to play up all the colors that you see in the sky around the fireworks. Of course the fireworks can be bright and colorful but many times it seems like the surrounding sky lights up in beautiful pastel shades and that’s what I wanted to capture! 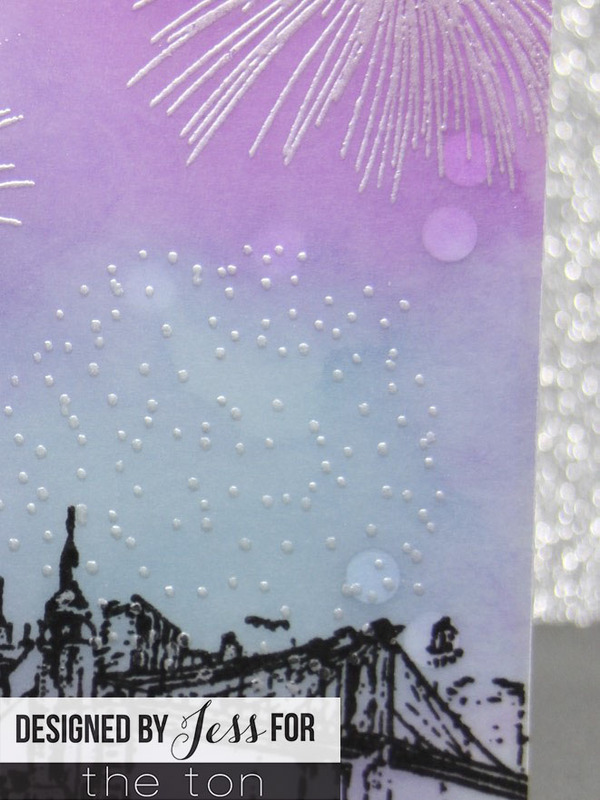 To create this card I took a piece of vellum and stamped the fireworks from Pyrotechnics before heat-embossing them with silver pearl embossing powder. I stamped the sentiment fro Pyrotechnics and heat-embossed it with silver powder. Finally I stamped the skyline in versafine onyx black and heat-embossed it in clear powder. Then I turned over the vellum and blended alcohol inks onto the vellum. To create the water I used a downward motion to keep the ink in vertical lines. Then I blended three inks over the fireworks. I let each color dry for a few seconds before layering another color. 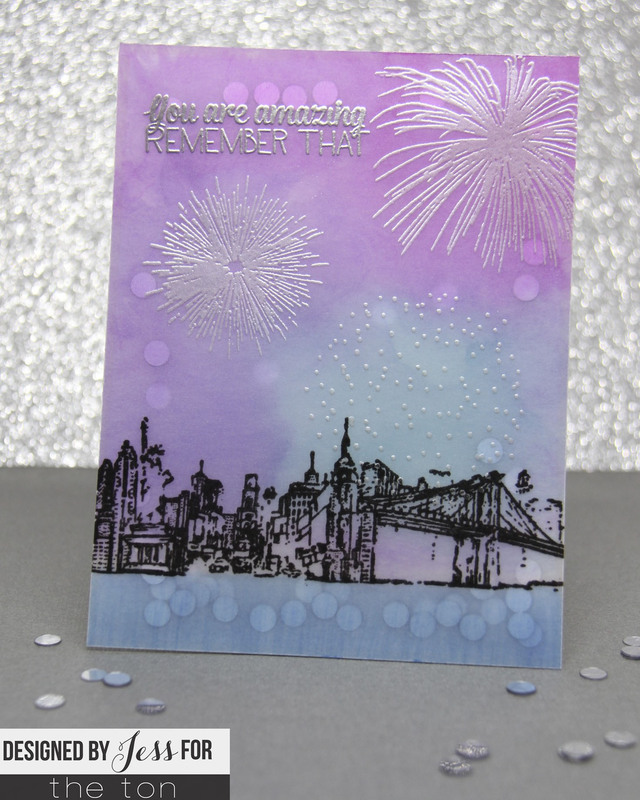 Then I decided to make the card into a shaker…still not quite sure why…but oh well, I like the way it turned out! 😉 I decided that I didn’t really want to add a frame to the card to hide the adhesive but I also definitely didn’t want foam mounting tape or fun foam visible beneath the vellum. So it was time to experiment! I took a scrap piece of vellum and tried various adhesives and all of them were way too visible beneath the vellum until I tried Be Creative double-sided tape! It’s really thin (which means you can’t have a super thick shaker) but it’s easily cut into thin strips and it’s barely visible which makes my shaker look really clean! I’ll definitely be trying this again soon!! Anyway, I put a very thin layer of double-sided tape all around the edge of my shaker and then added a sprinkling of Silver Round Confetti. Finally I carefully placed the vellum panel over the shaker and pressed firmly to seal the edges. I mounted that to a white card base and that’s my card! Now, again, the tape is very thin so my shaker doesn’t really shake but I’m going to experiment with putting down more than one layer of tape to see if that makes it a little thicker! But isn’t that a fun effect? I love how it looks seamless!! Anyway thanks so much for visiting and I hope you enjoyed my card! Have a fabulous week and see you next Monday! Such a beautiful shaker card! I love that inked background! So pretty, the cityscapes and fireworks work so perfectly together! What a cool card Jess has made for The Ton!! Gorgeous colors!! This is so beautifully done, Jess!